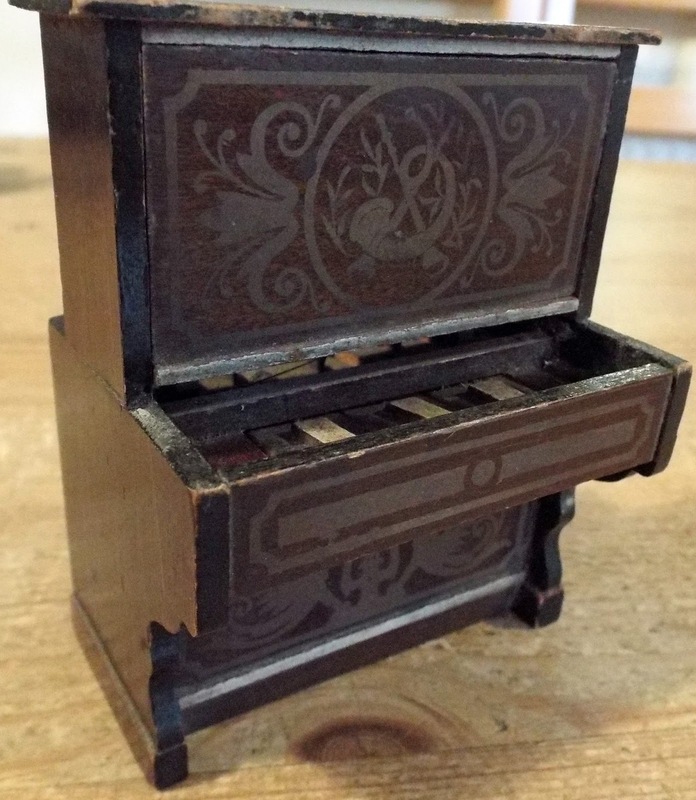 Some Real Rare Miniature Beauties Sold Recently! 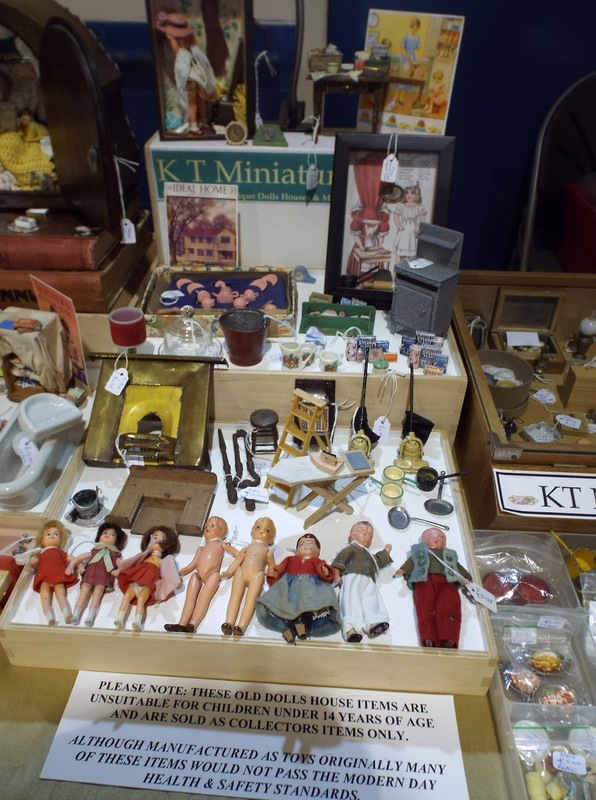 If you have been following KT Miniatures these past few days, you will know about the collection of rare dolls house miniatures which went up for sale last Friday afternoon. 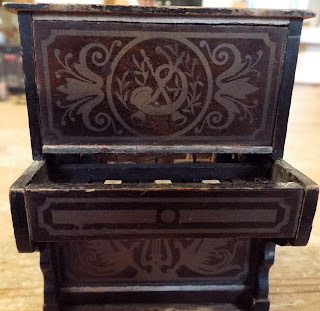 These much loved treasures had been handed down several generatons of the same family but over the past few decades had been simply gathering dust in an Oxford attic. Although much was sold very quickly within the first few hours, there are still one or two more wonderful items still waiting for new homes. 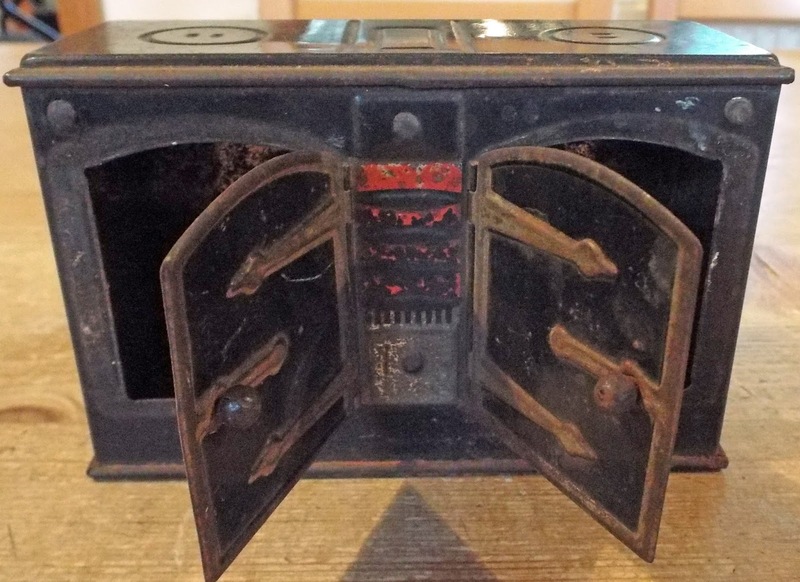 However, as much of the collection is now residing with their new owners or still in transit to distant lands, I thought it would be nice to feature a few of the more unusual pieces on here. This is a painted tin range which originally would have been sold containing Huntley & Palmer biscuits. The range has two opening doors with lovely embossed and painted detail. 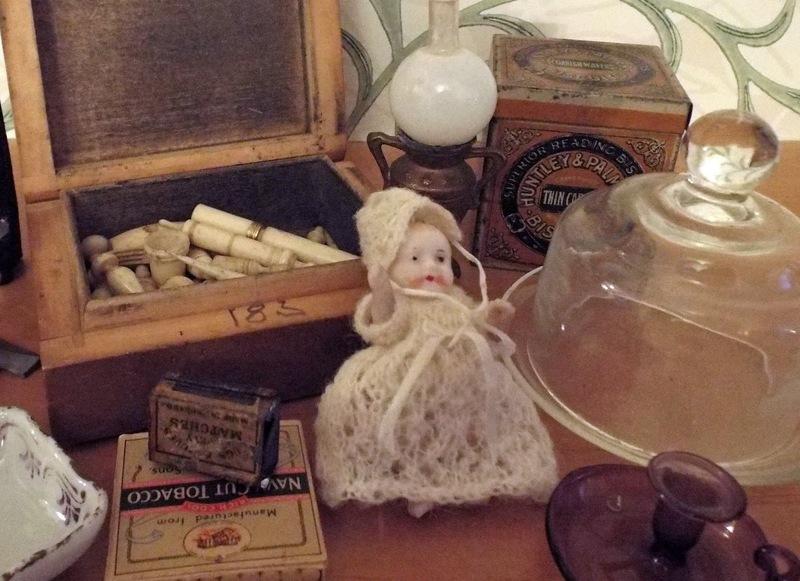 It is quite large in scale but in our antique dolls houses, often scale is inconsequential anyway. I for one just collect what I like and as long as it fits into the old dolls house, then I don't mind if the little dolls have to stand on chairs (or stepladders) to reach! 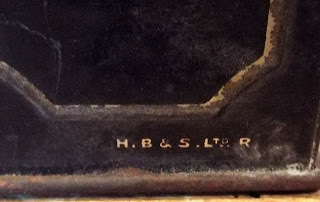 At the lower right hand side, as you can see from the photos, is the makers mark H.B. 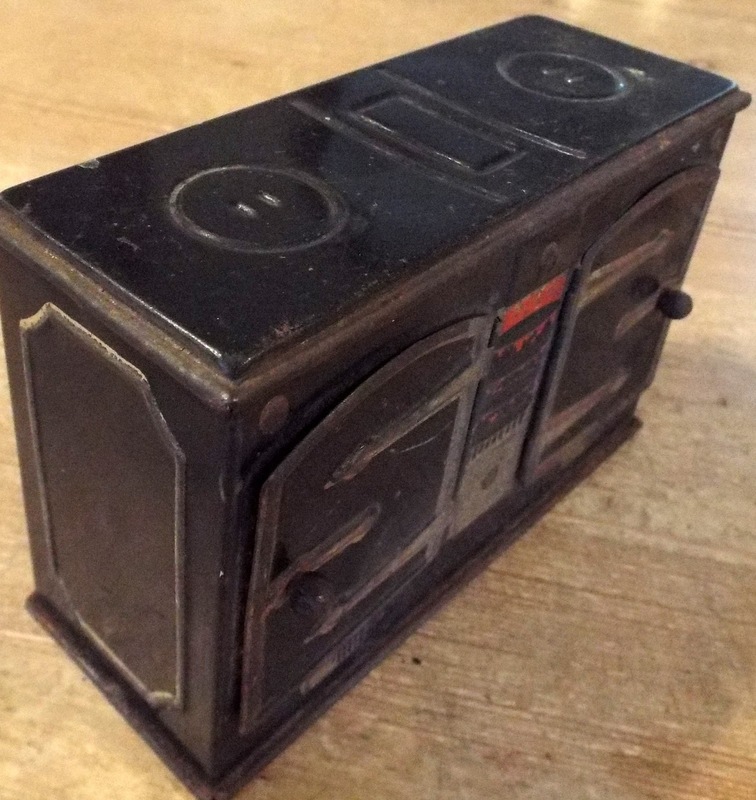 & S LTD. R. This was made by Huntley, Boorne & Stevens and would have been sold containing Huntley & Palmers biscuits. I love the extensive detail on this range and the lit fire is so effective. Both the large doors open wide giving good access to the inside, but you wouldn't want to put your biscuits in there now due to one or two specks of rust! 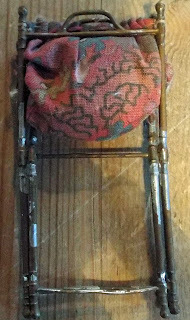 I am still receiving a number of enquiries concerning this item as it has had RESERVED next to it since Friday evening. Sorry folks, but I can confirm that it is still definitely reserved and I am simply awaiting payment. 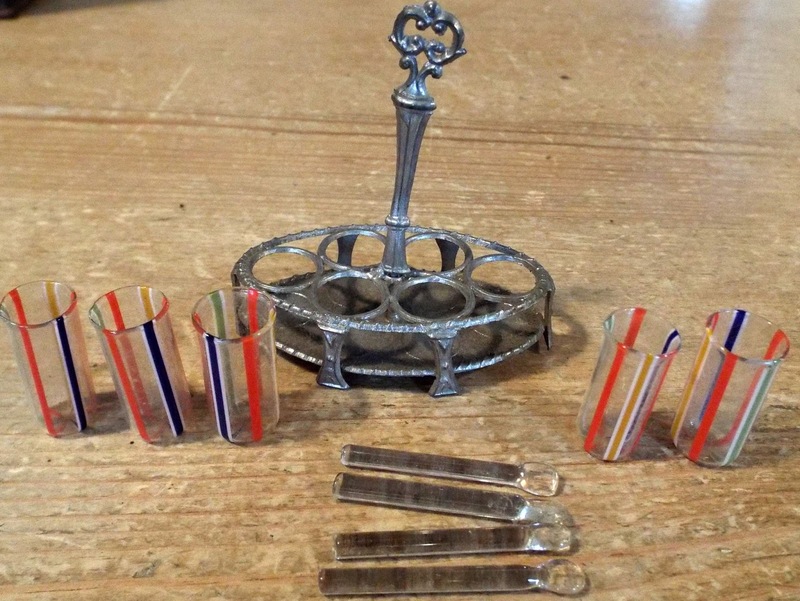 You may see these early 1900s German soft metal racks from time to time, but rarely do you see so many glass striped tumblers still present and in such super condition. 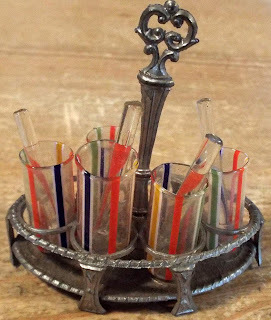 Even more rarely do you see this set with glass spoons! Yep, there are four glass spoons. How on earth these pieces ever survived many years of being handled by young hands, is beyond me....but how fantastic that they did! The glasses are very pretty with their bright coloured stripes but just look at those spoons. Two of them may be missing but see how delicate and tiny they are! I have to confess that I do not recall ever having seen a clock quite like this before, nor have I been able to unearth any information from my extensive research within all the literature and resources I have here. So I would proclaim this to be quite rare indeed. 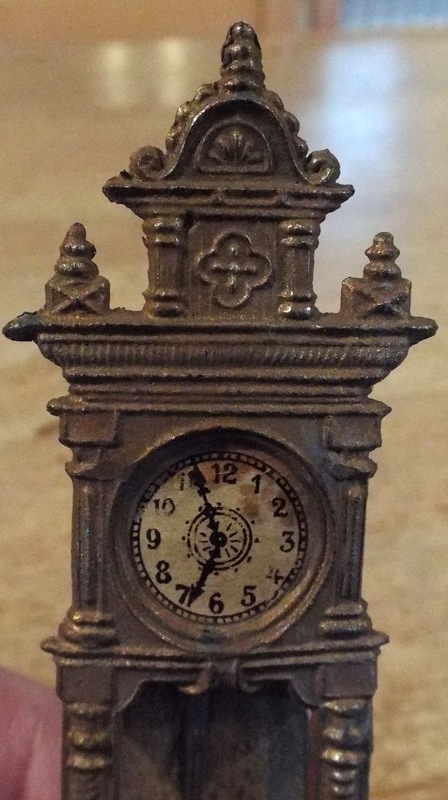 Due to the heavily ornate overall design to this metal grandfather clock, I would say that it is probably from the Victorian era, possibly mid to late 1800s? It comes complete with what appears to be the original paper clock face and a moveable metal pendulum. Whether this is of British origin, German or from some other country, I do not know. There is something scratched on the back but I just cannot make it out at all. 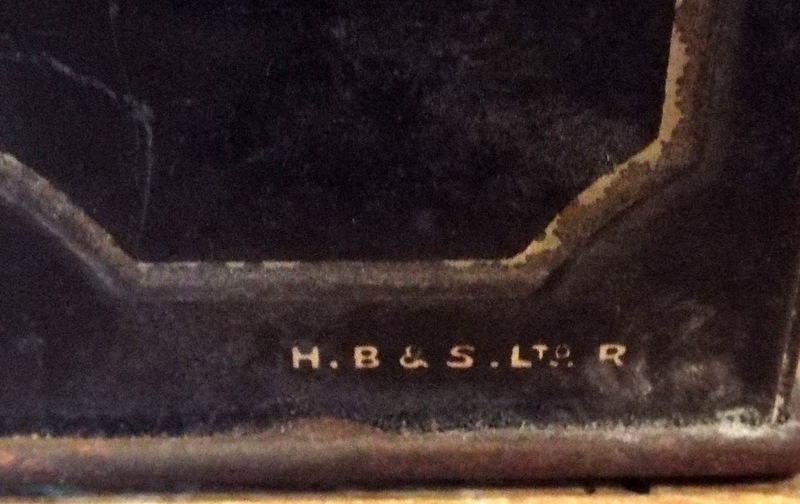 I have attempted to photograph these marks but if anyone out there can shed some light on this clock, please do let me know and I can then pass the information onto its new owner. 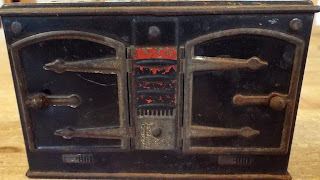 The back part appears to be a panel of tin and acts as a prop which enables this whole clock to stand up. However, looking very closely at the base of the clock, I strongly suspect that there should have been a tiny foot at each front corner of the lower edge. 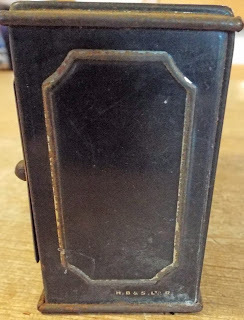 As judging by the slightly jagged corners, it appears that whatever was there originally has been snapped off, albeit a very long time ago. 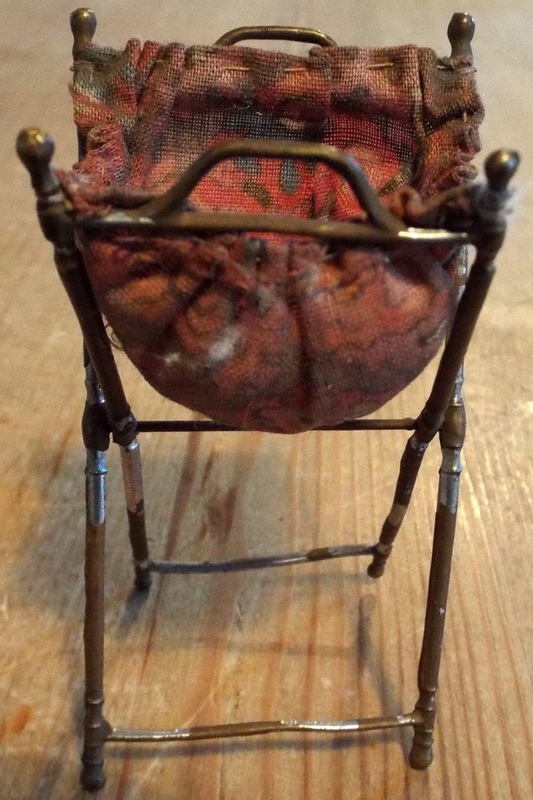 But to be honest, this is barely noticeable...and what we have here is a stunning antique clock which would brighten up any antique dolls house...a truly fantastic and rare item! I understand it is already happily in situ in its new home. What an unusal find this is! 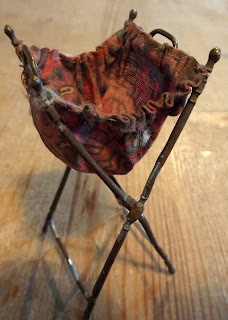 Here is a rare soft metal folding sewing stand, complete with old material which is attached and acts as a bag to contain all your miniature sewing items. 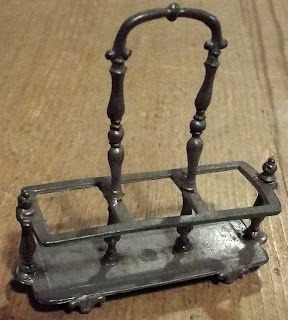 Probably late 1800s/early 1900s. 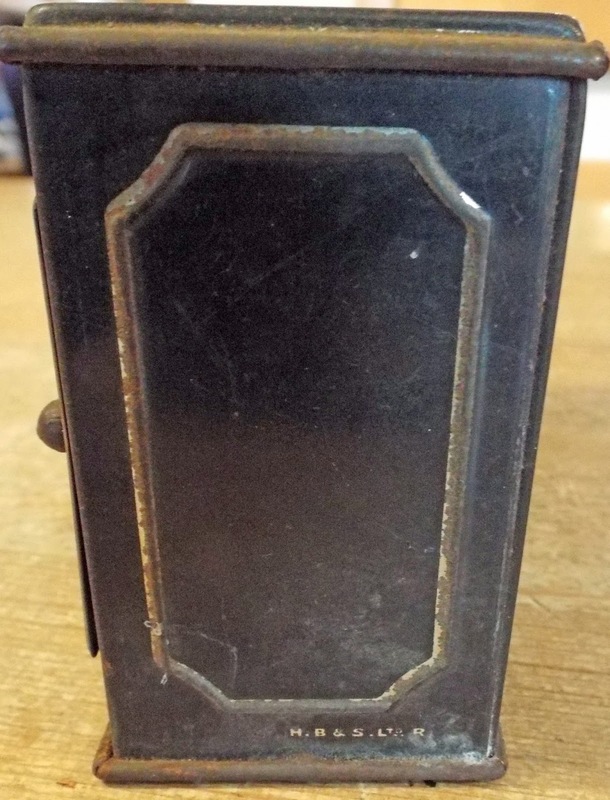 I am assuming that the material is the original, it certainly looks old and faded. 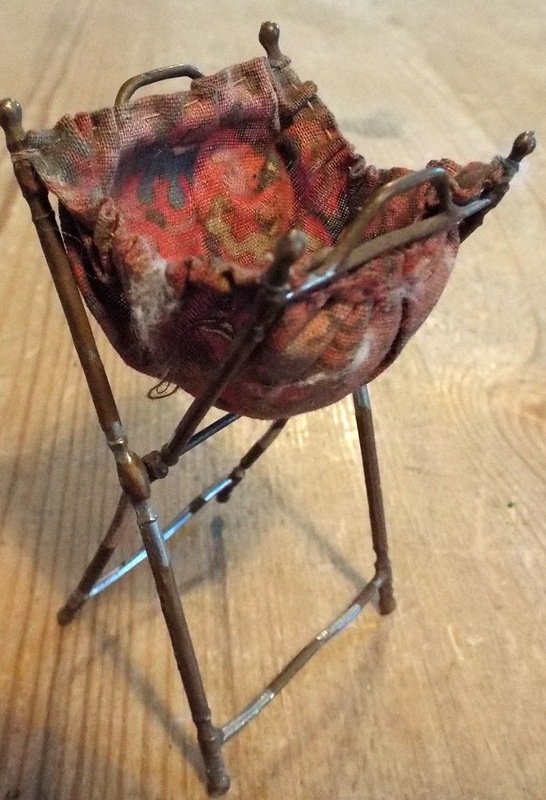 The soft metal is obviousy in a playworn condition, with considerable loss of gilt colour off the metal stand and the lower bars are slightly bent from child's handling. But what a super item this is. 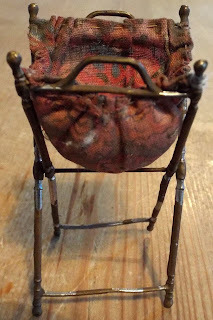 I have included some little homemade bits and bobs that came with this, such as wool around some cardboard, piece of material with stitches in, etc. I think it is only right that these stay with it. 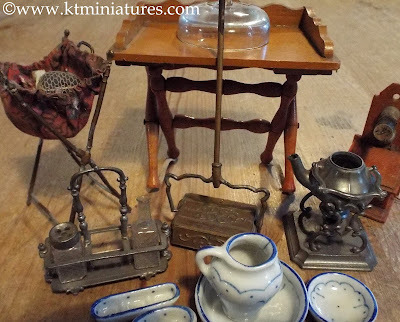 KT MINIATURES' OXFORD COLLECTION IS NOW UP FOR SALE! "The Oxford Collection" went up for sale on KT Miniatures late yesterday afternoon. 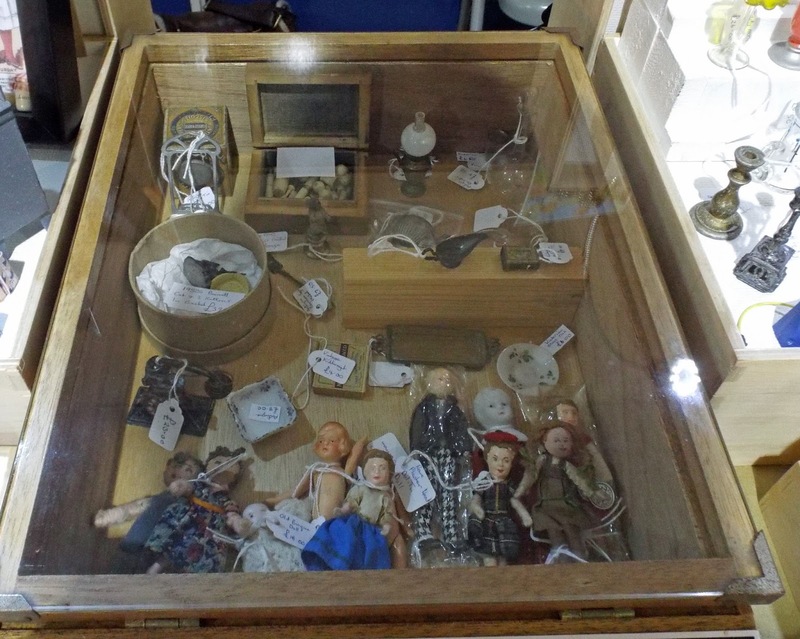 Business has been amazingly brisk and much of the collection has been either sold or reserved, but there are still some rather lovely pieces for sale. 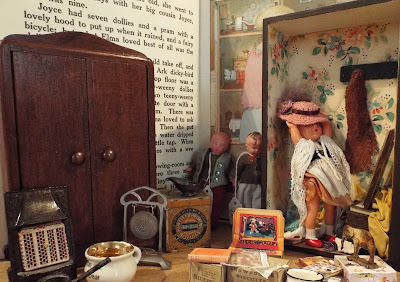 This is a very special collection of antique dolls house miniatures that belonged to several generations of one family and which have been hidden away in an Oxford attic for many years. Once rediscovered, the family felt that these old treasures should not stay in boxes for evermore but should be seen and enjoyed by those who love such things. As far as I can tell, this collection appears to date from the mid/late 1800s through to the 1930s, spanning over various generations. Some are quite rare, as you will see. I have called this set of miniature treasures "The Oxford Collection" and have grouped them all together on one special page. 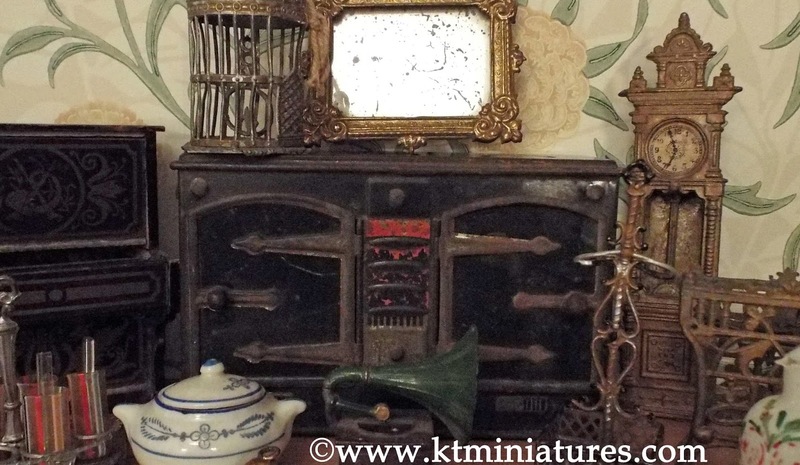 That page will stay live until most items have been sold, then any remaining items will be moved to the usual categorised pages within KT Miniatures' Antique & Vintage section. 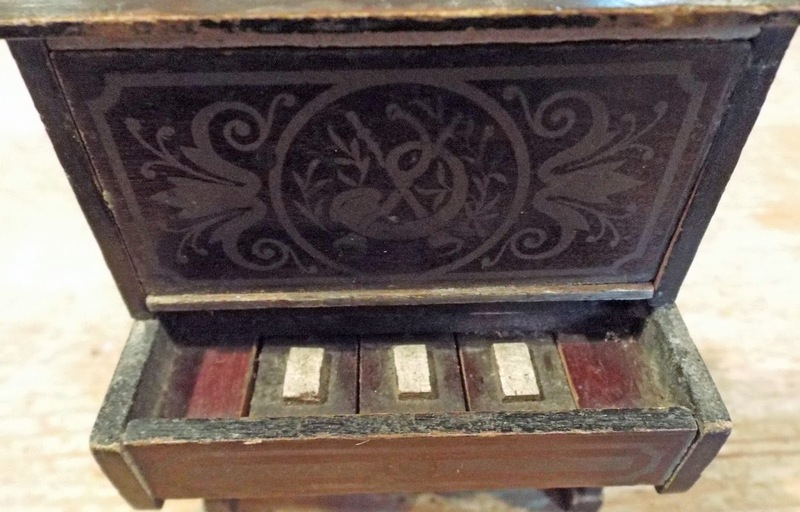 Although it is missing the slide-in lid, the rest of this Biedermeier piano is fully intact and in super played with condition. 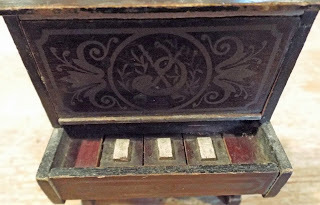 It dates from around c1860-1890 and has the very distinctive imitation gilt inlay. 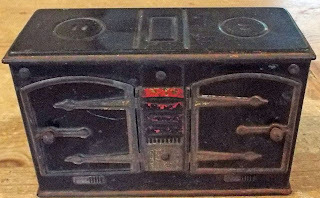 The three large chunky keys can be pressed and kind of move...but sadly for effect only, you most definitely can't play a tune on this! 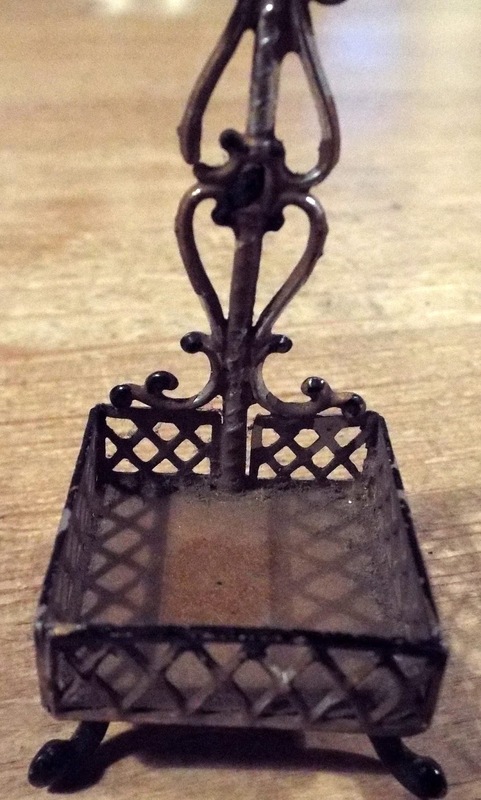 Rarely does this item ever come along, so here is a fantastic opportunity to purchase something rather special for your antique dolls house. Then there is this wonderful late 1800s/early 1900s soft metal German umbrella/walking stick stand for the antique dolls house hall. This is very delicately ornate and very attractive. It is marked MADE IN GERMANY underneath. 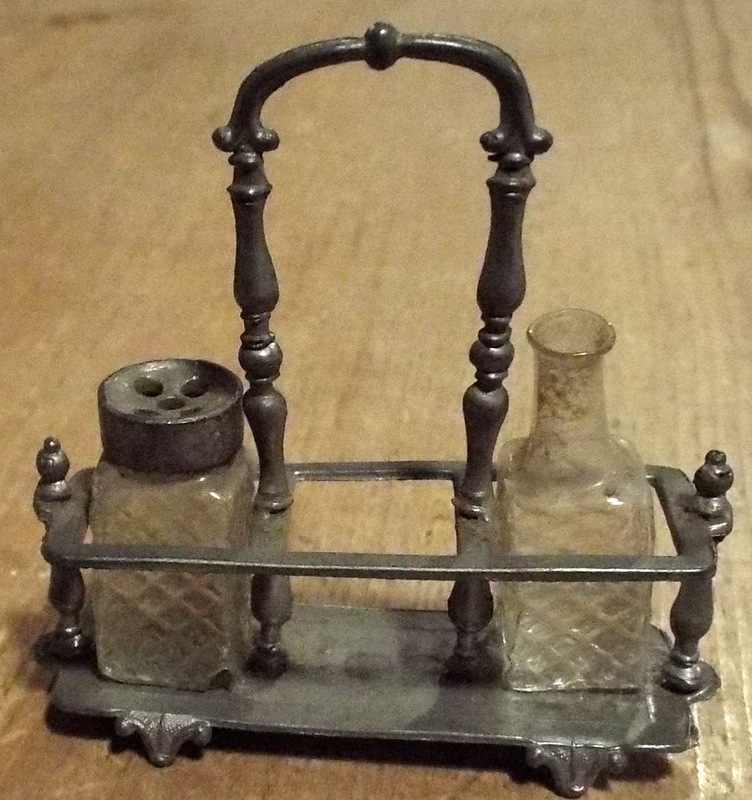 Another rather lovely item is this soft metal German rack with two condiment bottles. 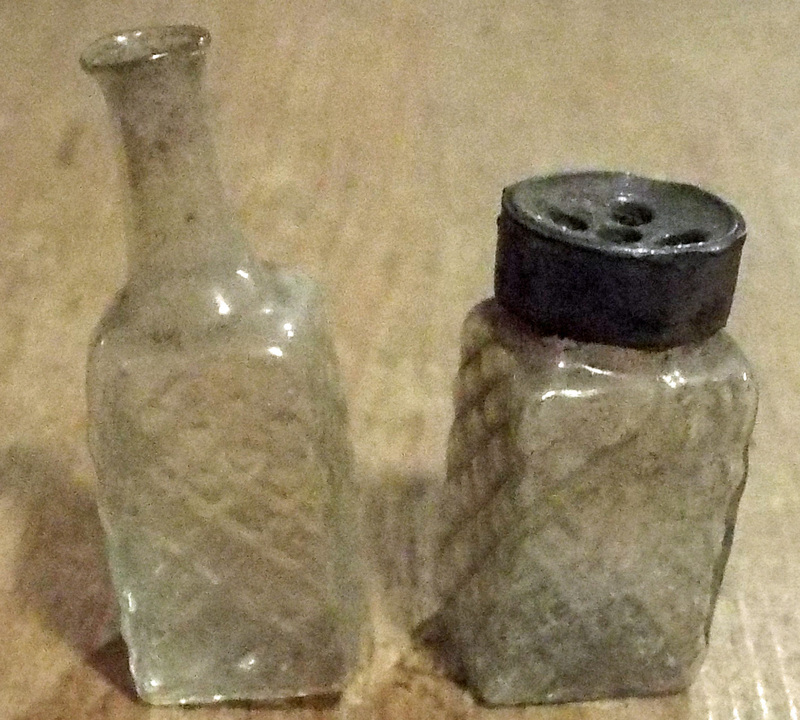 The bottles are made of quite delicate glass and have an attractive crinkled pattern around the sides. The larger bottle is presumably for vinegar and the other that has five holes in a metal lid, for either salt or pepper. 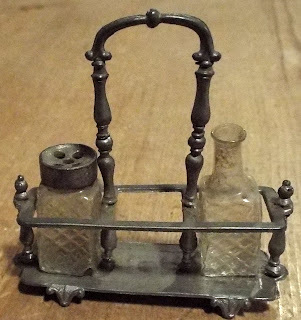 As you probably have guessed, there should be another bottle with metal lid but sadly is long gone. Still, this is a very nice item indeed. 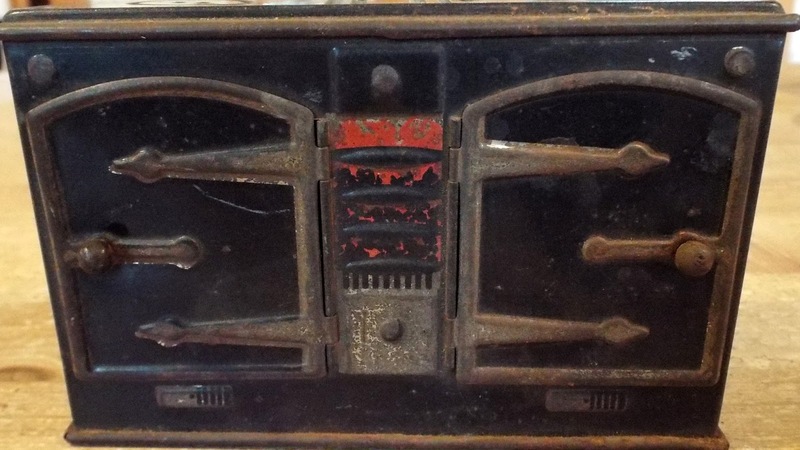 I have to admit that at the moment I do not know the make or even the exact age of this wonderful metal bath and sink but am surmising that they were possibly made in the 1920s/30s era? I do not even know if they are from the same manufacturer but as they came together in this collection, I am selling them as a pair. They are more like 1/16th scale but the bath in particular is gorgeous! It has been painted on the exterior underside a pretty blue and the interior in such a way that it appears like a real enamel bath. Even has real chips in the paintwork and looks quite authentic! The sink is also blue but a slightly paler shade. The metal taps on the sink appear to be very similar style to the bath taps, albeit quite a bit smaller - so maybe they are from the same manufacturer? The Oxford Collection Is Expected To Go Live Today! THE OXFORD COLLECTION is due to go up live on www.ktminiatures.com later today. This is a wonderful collection of antique dolls house items (some are quite rare), rediscovered in the attic of an old Oxford house, which has been handed down various generations of the same family, dating from mid to late 1800s, through to the 1930s. The link to this special collection will go live on KT Miniatures Home Page at the end of the afternoon today (UK time) and will be sold on a first come, first serve basis. As always, they have been valued on age, rarity and condition. Over the next few days, I will feature some of the gorgeous items on here, whether they have been sold or not. 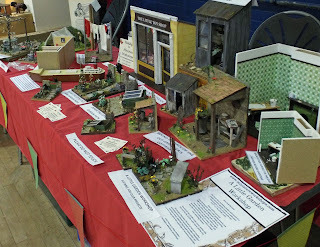 Huge thanks to everyone who came to see us last Saturday, at the Haddenham Dolls House & Miniatures Exhibition. Although the weather was a bit on the wet side, it was so good to meet up with both long standing customers and others for the very first time....what fascinating chats we had! As this is a small, relaxed and very informal event, it was great to see people being able to linger at their leisure around my stand. Plus for me, it was so nice to be able to have the time to chat properly to customers. At the bigger and much busier events, it is frequently not possible to converse for long, as often we are rushed to serve people who are wating patiently. 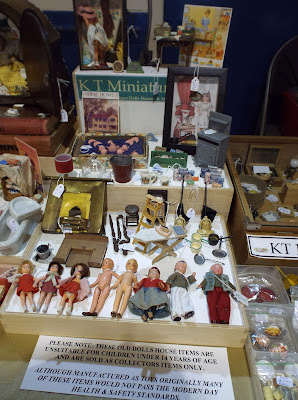 This cabinet containing some of the more special and more delicate items for sale on my KT Miniatures' stand, was decidedly much emptier by the end of the day! In between mine and my workshop colleague's Coombe Crafts stand (ie. Robin Britton) we had a table filled with many of our Nostalgia In Miniature Workshop projects, for visitors to peruse. Seeing so many of our past project prototypes in both scales (1/12th & 1/24th), out on the table in one go, was especially nice for us too, as many of these projects are tucked away in our cupboards year in and year out, barely seeing the light of day. In fact, it is because of our increasing lack of storage space, we are now selling several of these off.....but more about that another day. I snapped this photo very quickly of Robin, making the final preparations to her stand, just before the event opened. Haha....she was too busy to notice! Well done to the brand new organisers of this event - Ron & Felicity Holland and a special thanks to those lovely volunteers who helped tirelessly on refreshments, raffle, etc. I hope a good amount was raised for the two charities. 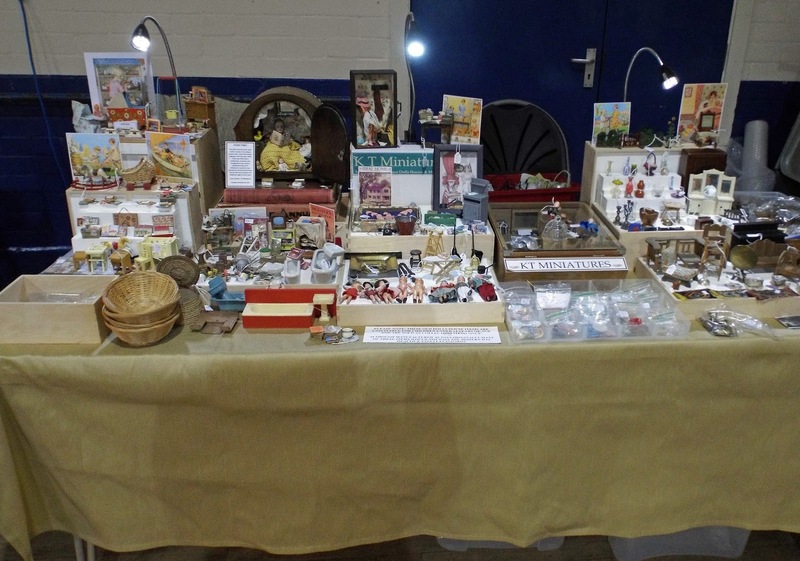 Not only am I looking forward to next year's Haddenham event but it is now just three months away from when we have our usual double stand at the wonderful Thame Dolls House & Miniatures Fair- taking place on Saturday 27th February 2016. Hope to see you all there too! 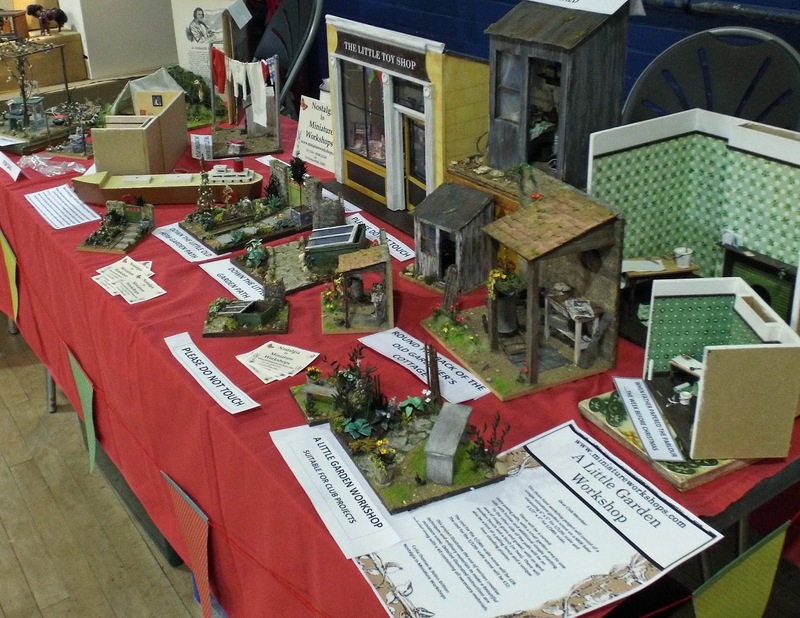 This Saturday, KT Miniatures will be attending the Haddenham Dolls House & Miniatures Exhibition. 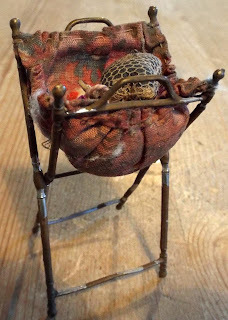 I will have a 6ft stand filled with a selection of my handmade and antique/vintage miniatures. 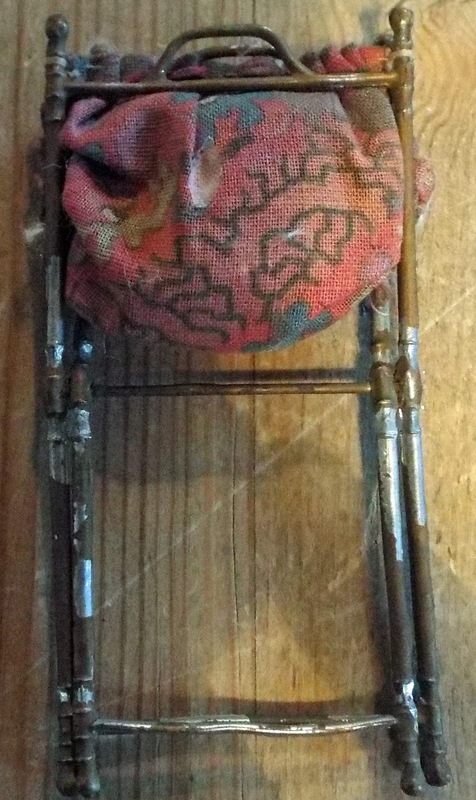 In the photos above and below, is a taster of just a few of the handmade and antique/vintage items I will be taking. Due to limited space I will not have any dolls houses for sale with me this time - sorry. 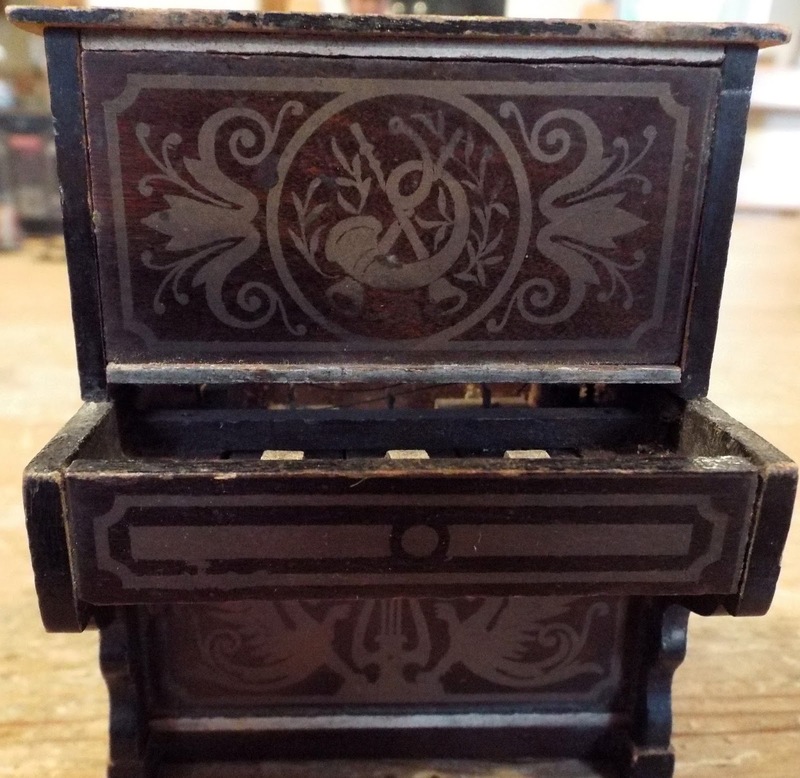 But as always, there should be one or two "Bargain Boxes" filled with an assortment of random old pieces for you to rummage through. Plus I will have some of Marion Osborne's books for sale (all three titles), but they will be behind my stand due to lack of table display space so please just ask if you come, are wanting to buy one of them but can't see them anywhere! 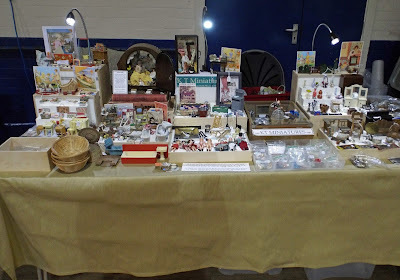 Between Robin of Coombe Crafts (my workshop colleague) and KT Miniatures stands, we will have an additional table of some of our Nostalgia In Miniature Workshop projects on display. Plus one or two of our old project prototypes will be available to purchase, as both Robin and I are rapidly running out of storage space and simply cannot keep them all. 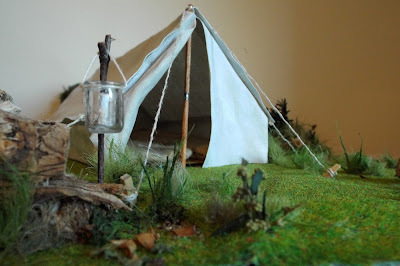 We shall also be putting up for sale our "Let's Go Camping Scene" that was featured in Dolls House & Miniature Scene magazine earlier this year. 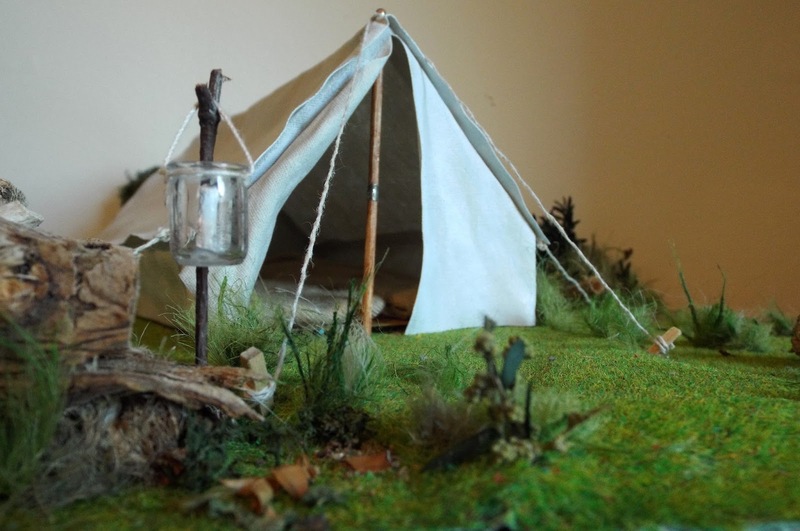 Several dolls house clubs from the surrounding area as well as individuals will be exhibiting their creations. There will also be some artisan/trader stands, so you will have an opportunity to do a bit of miniature shopping too.This delightful biannual event has been run for many years by Freda & George Dorrell but they have finally decided to retire from organising. Thankfully though, Felicity & Ron Holland (organisers of the Thame Dolls House & Miniatures Fair) have agreed to take it on and keep it going. 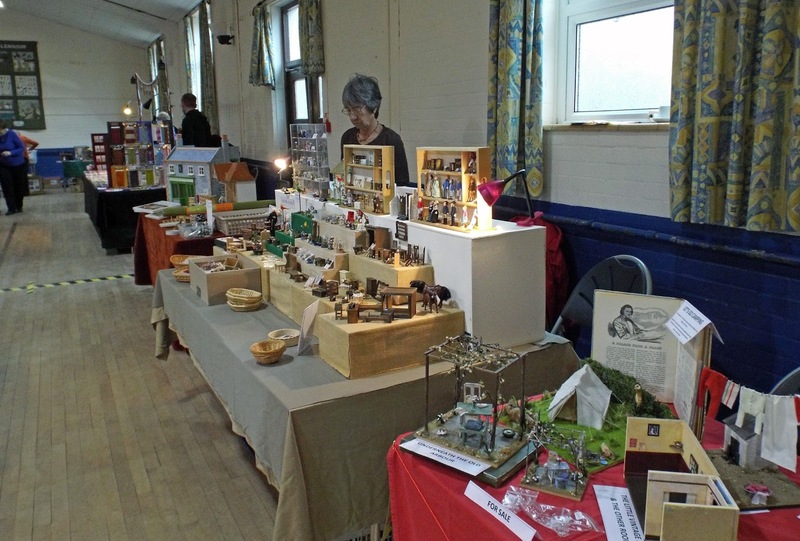 The Haddenham event gives miniaturist enthusiasts a unique opportunity to see the creations of some of the many very talented club miniaturists and individuals who would not normally exhibit their work. You will be able to peruse their inspirational creations at your leisure and members will be on hand to chat to you. The two chosen charities this year will be Hearing Dogs For Deaf People & Thames Valley Air Ambulance. Haddenham is just less than 2 miles from Thame and a few miles from Aylesbury, close to Junctions 6 & 8a of the M40, has its own Chiltern Line mainline station (Haddenham & Thame Parkway) with direct routes from Birmingham and London Marylebone. HOPE YOU CAN COME....IF YOU DO, PLEASE DROP BY MY STAND, WOULD LOVE TO SEE YOU!